Successfully Added 1200 Lumen Android Projector - 1080P Support, 25 to 100 Inch Display, Android 4.4, Kodi, Dual Band Wi-Fi to your Shopping Cart. 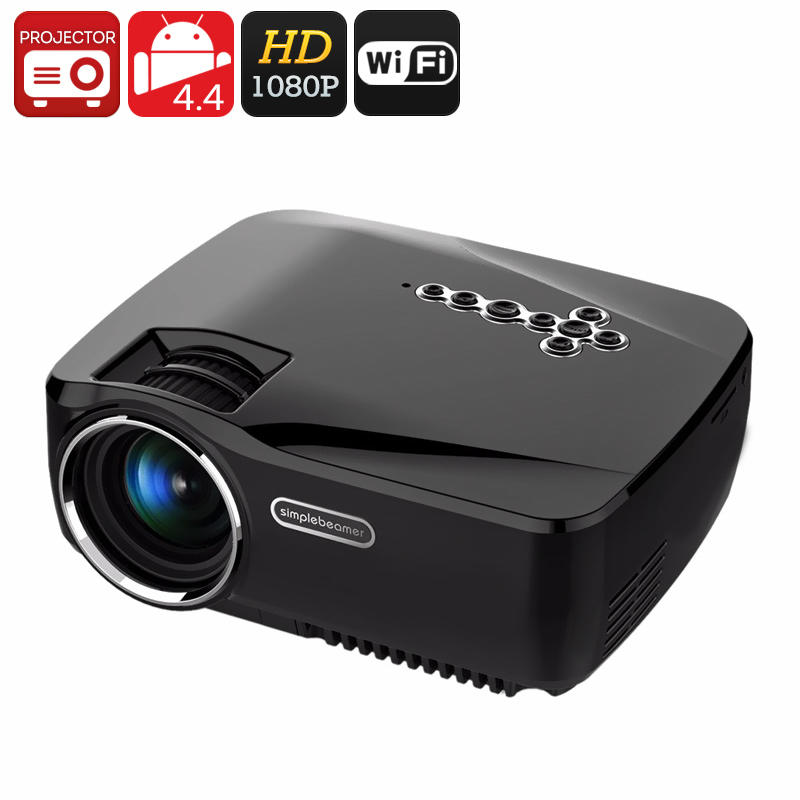 The 'G700' is a fantastic high lumen portable projector featuring a quad core CPU, and runs on the Android 4.4 operating system with the bonuses of Wi-Fi and Bluetooth connectivity. This LED projector offers great flexibility with its 1080p support it can play full HD videos that look great when displayed at 84 inches in the 800x480 native resolution. The 1200 lumen output offered by the projectors LCD+ LED optical display technology means you get a bright crisp image with great detail and color depth that picks out all those subtle shades, thanks to the 600:1 contrast, ensuring the whites are 600 times brighter than the black images. With an Android operating system at the heart of the G700 projector there are plenty of productivity options including e-mail, office applications, such as spreadsheets, documents and presentations as well as photo editing and web browsing not to mention the great gaming potential that is available from the Google Play store. The advantage of having Android running on this wireless projector means you have a fully functions stand alone minicomputer and with its Wi-Fi connectivity you can stream content such as movies and TV shows from a range of sources such as YouTube, Netflix and Hula. Another great bonus is Kodi media player that comes reinstalled on this system. This brings access to a huge repository of online content providing access to thousands of channels containing the latest TV and movie entertainment. Dual band 802.11 b/g/n 2.4GHz / 5GHz wireless connectivity means you get quick stable connections and can stream media direct to the projector without the need for any messy cables making it ideal for use anywhere around the home or workplace. With micro SD card storage you can boost the built in 8GB of memory with 32GB of additional storage so there is plenty of space for all your media. This LED Android projector comes with a 12 months warranty, brought to you by the leader in electronic devices as well as wholesale projectors..
Bahasa Indonesia, Bahasa Melayu, German, English, Spanish, Filipino, French, Italian, Magyar, Dutch, Portuguese (Brasil), Portuguese (Portugal), Vietnamese, Greek, Russian, Hebrew, Arab, Thai, Korean, Chinese (simp), Chinese (trad).